Introducing two pups together is something that requires some degree of planning beforehand. Sure, your pup may be perfectly happy to run around and play with their friends, but home territory is a different story altogether. Because of this, parents will have to ensure there is an adjustment period for the two pups for about a week at least. 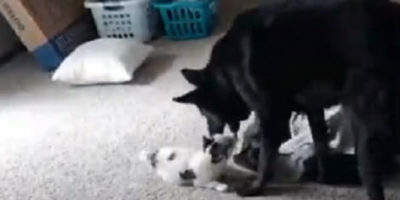 This is why this black German Shepherd is only now meeting his new sibling for the very first time. And as it turns out, he absolutely adores his 9-week-old sister, Ciri the spotted Husky! It is clear in the way he interacts with her that he is very aware of just how big he is compared to her, and how small and fragile she is as a puppy. Who knew a pup could be so aware and attentive? Luckily, Huskies are pretty sturdy pups at their full size, so once she is fully grown, the two can rough-house!